Water is not only a resource, it is a life source. We all share the responsibility to ensure a healthy, secure and sustainable way of applying water now and in the future for our communities, environment and economy – our lives depend on it. Unless sustainable water practices are implemented, half of the world’s population will be exposed to water scarcity by 2050. The massive volumes of process water wasted in the food and bioprocessing industries represent an environmental burden that can be turned into a resource. The hypothesis behind our research is that, using sensor-based “fingerprinting”, process water can be utilized in a far more intelligent manner than present practice. Our project - “REuse of WAteR in the food and bioprocessing inDustry” (REWARD) - proposes the novel idea of applying the successful principles of HACCP, Process Analytical Technology and Quality by Design to production and cleaning water management in the food and bioprocessing industry. REWARD will establish a research community that provides the knowledge to bring Danish industry closer to self-sustainability - the closed factory principle - where water intake is diminished by re-using production streams. This will provide the Danish food and bioprocessing industry, challenged by productivity and outsourcing problems, with a leading edge and will put Danish processing and measurement equipment businesses at the forefront of modern process water management practice. REWARD focuses on process water cases from the food and bioprocessing industries with multi-product lines and includes technology providers working with generic principles adaptable to other industries with related challenges such as the brewing industry, vegetable/fruit processing, bio-refineries and the fermentation industries. 1. Maximizing reuse of process water and minimizing intake of potable water without compromising safety - working towards the closed factory - by implementing Process Analytical Technology and Quality by Design methodologies. 2. Introduce active real-time measurement based monitoring and control regimes of process and cleaning water for enhanced production and/or cost reductions in a sustainable way using dairy and fermentation processes as a model system and implementing the methods in fullscale production with the industrial partners. 3. Enable real-time monitoring of the chemical and biological water quality and equipmentsurfaces by employing novel in-line spectroscopy and developing nano-technology based measurement principles. 4. Forming a strategic research project and a knowledge platform between leading universities, major service providers and the industry aimed at solving problems related to water reuse by introducing new state of the art technologies and methodologies. The outcome of WP1 is to establish an active real-time monitoring system for control of process water, cleaning water and filters using in-line spectroscopic and novel nano technology sensors. 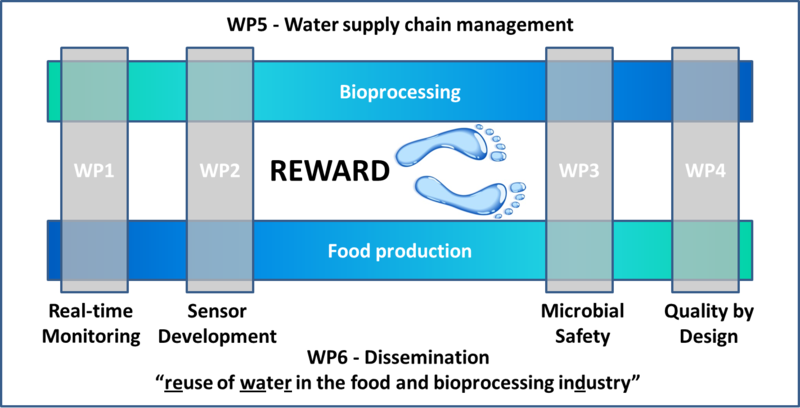 The aim of this WP is on the one hand to establish an active real-time monitoring system for control of process water, cleaning water and filters and on the other hand to implement active monitoring and control of fouling and test commercially available in-line spectroscopic and novel nano-technology sensors. We will use Process Analytical Chemistry & Technology to establish the background information required for identifying and optimizing reuse strategies for process water in cooperation with WP5. The first step will be a thorough characterization of the chemical composition of evaporator condensate and reverse osmosis permeate using liquid phase extraction and headspace GC- S, LC-MS and spectroscopic techniques. We will initiate an exploratory study into the composition of various process water streams in the participating food production facilities. The aim is to actively monitor and control (reduce) filters and surface fouling by a combination of real-time measurements and new engineering principles. In addition, we will investigate and develop new analytical methods for (near) real-time measurements on biofilm formation/surface contamination in the food and bioprocessing industry. These methods will be based on novel spectroscopic techniques such as hyperspectral near infrared imaging with both a chemical and spatial dimension. Chemometric modeling techniques will be used to analyse the wealth of data coming from these analytical methods, which will need sophisticated chemometrics in order to translate the resulting data into information and knowledge that can be used by both process operators and product developers. The investigation will include the prototype nano-sensors of WP2 and the knowledge obtained from WP4 and WP5. The outcome of WP2 is to develop and implement new nano-based sensors that are specifically targeted to water impurities in the dairy and fermentation industry. This WP aims at developing and interfacing an appropriate combination of sensors which are sensitive enough to detect the small amounts of residues found in e.g. evaporator condensate and reverse osmosis permeate which can be used to classify different levels of purity and types of permeate streams sampled after various purification steps. The developed sensors will be employed in WP1 and WP3. In the initial phase several sensor technologies already available at DTU.NANO will be investigated including a modular microfluidic technology, consisting of custom-built microfluidic pumps, valves and amperometric detection. In addition, colorimetric sensor arrays will be introduced. These sensors are based on chemo-selective compounds that can identify a broad variety of target compounds, by changing in color instantly in real-time. Single use disposable micro-chips will also be used in combination with the microfluidic system, to classify different levels of purity and types of permeate streams after various purification steps. Microfluidic amperometric sensor arrays will be based on the same class or additional compounds of chemo-selective compounds as in the colorimetric sensor arrays, acting as electrochemical mediators where the redox potential changes upon complexing with a ligand. Based on the initial investigation of sensor technologies, selection of technology will be decided, with emphasis on optimal integration of the various measurement systems in the process water streams plus the implementation of calibrated measurements for use by highly sophisticated on-line multivariate data analysis methodologies developed in WP1 and WP4. The outcome of WP4 is to link on-line monitoring methods of control points in the water treatment and reuse processes to the microbial safety and quality of selected industrial process water streams. The aim of this WP is to characterize the microbial quality and safety in Critical Control points of selected industrial process water streams intended for use and reuse, and the potential for survival and growth further down the supply chain (storage, transport and final use). This will also include the ability to reveal tools for, within an operational time scale, determining contamination at critical process spots and use these to carry out on-line microbiological control of process water. Both culture dependent and independent methods will be used in the characterization. Specific dairy relevant bacteria (e.g. Bacillus cereus, Staphylococcus aureus, and Listeria monocytogenes) will be used for challenge studies. In addition, easily usable substrates for microorganisms, Assimilable Organic Carbon will be measured in order to determine the bio-stability of the water, and monitoring options (spectral imaging, sensors, conductance, ATP, etc.) and their sensitivity in different water streams will be evaluated. Together with the work carried out in WP1 the potential for build-up of biofilm will also be investigated as a function of microbial populations, residence time, and temperature and the implications for food safety of the final products will be evaluated. Mathematical risk assessment models will be established in order to convert the on-line microbial measurements into on-line microbiological risk assessments at critical control points. The microbiological assessments will feed into the overall design space process models developed in WP4. The outcome of WP4 is to enable design of suitable in-line risk-based decision tools for control of water quality in industry. This will be done by expanding existing mathematical models, or developing new engineering descriptions of process and cleaning water flows and use. These models will be combined with advanced (stochastic) analysis tools (e.g. uncertainty and sensitivity analysis) to define process design-spaces in real production scale. These design-spaces will define regions of “best practice” where safe operation is guaranteed, while the models can be further employed in e.g. Model Predictive Control. The methodologies will be demonstrated with special focus on reverse osmosis water and CIP water, and will include active monitoring and control of process water and cleaning water. Characterization of existing process parameters forms a cornerstone of this WP. Knowledge on the variation of such parameters will be propagated through mathematical models. They establish a relation between uncertain operational parameters and variations to the water's chemical and microbiological composition on the one hand, and the resulting variation of the water quality on the other hand, for example when different control strategies are applied. Therefore, a close collaboration with WP1 will be necessary. By combining statistical experimental design and kinetic modeling, we will introduce small changes in process parameters and simultaneously collect and analyze large quantities of samples using the sensors investigated in WP1 and WP2 in order to demonstrate the validity of the approach. The outcome of WP5 is to develop decision support tools for water reduction and reuse based on the water monitoring and risk evaluation tools. The WP will develop decision support tools (prototypes) for water reduction and reuse based on the water detection and risk evaluation tools established in WP1-WP4. The tool will take into account both logistics and economic considerations. We will also tailor and apply such tools to a case study (dairy water reuse) to illustrate a representative business case, but the tool will be adaptable to guarantee use in a wide area of applications/industries. Both reduction and reuse of water resources will be investigated including (a) reuse within the process, (b) reuse within the factory (the closed factory), and (c) reuse within the supply chain, going beyond the single factory. The key task lies in increasing reduction and reuse opportunities by using an extended knowledge base to enhance process control and supply chain integration. This builds heavily on the analysis and development in the different work packages, and helps to valorize the results in the development towards an environmentally friendly and competitive industry. Throughout the project we will focus on legislation and environmental requirements for reuse of process water and since an understanding of the hygienic challenges associated with different applications and water quality parameter is necessary there will be close interaction with WP4 and WP3. • The project will be led and administrated by Søren Balling Engelsen, Professor at Department of Food Science (KU.FOOD), an application expert in spectroscopic studies of biological materials with extensive experience with chemometrics, spectroscopic quality control and process analytical technology as well as project management. • Renzo Akkerman is professor at the Technical University of Munich (TUM), expert in management and engineering processes for efficient planning of resources and activities in food production systems and supply chains. • Krist V. Gernaey is professor at DTU, Dept. of Chemical and Biochemical Engineering (DTU.PROCESS) and expert in process design, control and analytical technology. • Susanne Knöchel is professor in food microbiology (KU.FOOD), expert in microbiological food safety and quality and safety issues related to the reuse of industrial water for food processing. • Frans van den Berg is associate professor in Advanced Chemometrics in Food Technology (KU.FOOD), expert in process analytical chemistry and technology and quality by design. • Mogens Havsteen Jakobsen is associate professor in Surface Engineering at DTU Nanotech (DTU.NANO), expert in surface chemistry, bioassays and development of sensors for environmental monitoring. • Palle Lindgaard Jørgensen (DHI) is a senior researcher with expertise in sustainability and environmental impacts assessment of industrial processes and technologies, and a member of Advisory Board in the European Water Partnership. • DHI represents 50 years of dedicated research, and real-life experience from more than 140 countries in geological, municipal and industrial water questions. Designated as a not-for-profit organization DHI is able to invest 25% of its human resources in research and development. DHI co-operate with universities in Denmark and abroad and are recognized globally for our innovation and expertise. The headquarters are located in Denmark, but more than half of the employees work in one of DHI’s 29 offices around the globe (1,100 employees worldwide). • Arla Foods amba, a global dairy company co-operatively owned by Danish, Swedish and German dairy farmers. It has production facilities in 14 countries and sales offices in a further 20, total of more than 17,000 employees. The products are sold under well-known brands in more than 100 countries. • Novozymes A/S is with 6,000 employees the world’s largest producer of enzymes for technical purposes. Novozymes A/S has by decades of full-scale biotechnological production acquired knowledge and technology to push the development and optimize within this segment further. • LiqTech International A/S is a Danish based technology company with a leading edge in developing and marketing its own proprietary products to the environmental industry. At its core is the ability to manipulate Silicon Carbide which has allowed it to make a high value, high performance solution for liquid and gaseous filtration products. • DSS Silkeborg A/S develops and supplies membrane filtration technology for the dairy industry. It is a knowledge-based company and has more than 40 employees, and closely with highly specialized sub-suppliers and a number of suppliers of process equipment. • Alectia A/S is one of Denmark's leading engineering consulting businesses with clients worldwide. It provides planning, design and implementation of services within building and civil works, process engineering in food, beverages and pharma, as well as water and environment.